This is the second of two Points posts on Prop. 1183; the first is here. constituted the most abrupt and dramatic increase in alcohol availability that any state has experienced since the repeal of Prohibition (Holder, 1988). Not only did the number of outlets rapidly increase from approximately 200 state stores to approximately 800 private off-premise wine outlets and 400 spirits outlets, but also wine and spirits were brought within arm’s reach of nearly all grocery and convenience store shoppers. Sunday sales were legalized, hours of sales were extended, advertising was allowed and purchases could be made on credit terms. No monopoly state had abandoned its control over retail liquor sales before, although a number had abandoned monopolies on wine sales in earlier years. What happened after liquor’s privatization in Iowa? Well, for one thing, the change produced a memorable dustup in the contemporary alcohol science literature. In 1990, only three years after privatization, Harold D. Holder and Alexander C. Wagenaar published a paper in the British Journal of Addiction (more recently, simply, Addiction) suggesting that Iowa saw a 9.5% rise in spirits sales after the 1987 change. This of course was a far cry from the CDC’s 48%-anticipated-increase figure currently in play in the debate over Washington State’s would-be privatization. From Holder and Wagenaar (1990, p. 1618). 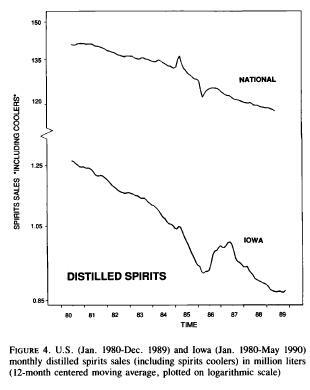 generally follow national trends….Furthermore, spirits sales in Iowa relative to nationwide sales trended very slightly downward over the two decades analyzed….In short, patterns of apparent consumption of distilled spirits in Iowa over time were similar to patterns seen in all other states, with the important exception of a significant increase at the time Iowa’s privatization policy was implemented (emphasis in original). Holder and Wagenaar acknowledged weaknesses in their analysis. Other changes in the recent Iowa history, they noted, might have influenced the spirits sales trend line. Moreover, they had studied only one state’s experience, not several, which would have been better. Finally, they had not studied the mechanisms through which individual and group purchasing were affected by changes like privatization. To this list might have been added of course the short time period between the privatization change and their paper’s publication. Several longitudinal studies have found significant increases in alcohol consumption, and in some cases alcohol-related problems, following implementation of policies which increase the availability of alcohol. We think it prudent to arrest the apparent trend towards privatization of alcohol distribution systems. This is particularly important since privatization is a policy change that, once implemented, is extremely difficult to reverse. Figure 4 shows that overall spirits sales in Iowa decrease at a slightly faster rate than those of the nation. Furthermore, as in the wine sequence, there are no long-term trend changes in either series around the time of the intervention. This supports the earlier conclusion that, as with wine, the privatization of spirits sales did not permanently increase Iowa spirits consumption. that increasing the availability of alcohol does not necessarily increase its consumption, but beyond that people’s drinking decisions and the alcohol availability/consumption connection remain scientific mysteries. If, as it appears, there is no lawful, causal connection between alcohol availability and alcohol consumption, then perhaps we should redirect our research efforts and seek to understand better the interplay of the multitude of weak historical, cultural, psychological, biological and environmental forces that influence people’s decision to drink or not, how much to drink and whether to change their intake levels in response to an availability change (emphasis in original). The controversy simmered into the mid-1990s, although the dispute, after its original exchange, centered chiefly on differences between the two camps’ assessments of privatization’s impact on wine consumption. Holder and Wagenaar had reported substantial post-privatization changes in wine consumption in Iowa whereas Mulford and Fitzgerald once again found no significant change. By 1996, as evidenced in an exchange of letters published in the Journal of Studies on Alcohol, the dispute between the two camps had grown as heated and sharp-edged as any I’ve seen in the scientific or scholarly literature. With replications in numerous states and countries, it is clear that privatization policies have typically resulted in substantial long-term increases in alcohol sales. Because previous research has shown that aggregate levels of alcohol sales and consumption are related to the burden of alcohol-related problems that a society bears (Edwards et al., 1994), policymakers should carefully consider these results before enacting privatization policy that, once implemented, cannot be reversed. Of course, 1987 is long past now. Now, in 2011, Iowa’s apparent spirits consumption trend can be placed in a larger and more interesting time context. Above, I’ve graphed Iowa’s (blue line), the nation’s (yellow line), and Washington State’s (turquoise line) per capita spirits consumption from 1977 to 2009. Iowa’s spirits consumption fell more or less smoothly from 1977 to 1986 – a decline that paralleled, though at a lower consumption level, the national trend for spirits over the same years. Apparent spirits consumption blipped upward in 1987 and then continued to trend downward, though less smoothly, until bottoming-out in 1994 and 1995. Iowa’s apparent spirits consumption then started an upward trend, first climbing slowly and then with increasing slope from 2003 to 2009. 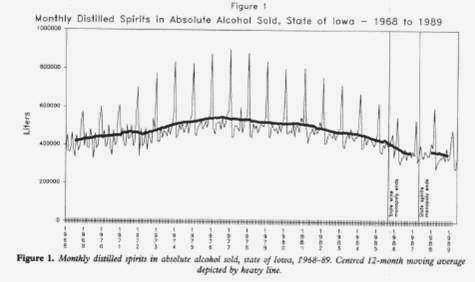 The picture created might perhaps be characterized as a slow lessening of the difference between Iowa’s spirits consumption and national spirits consumption levels — beginning in the 1970s and 1980s, with consumption substantially lower than the national average, and then, first slowly and then more rapidly, decreasing that difference, especially over the past half-dozen years or so. Iowa’s consumption trend remained generally downward after the 1987 privatization’s apparent blip. How much or how little the 1987 privatization may be regarded as causally relevant to increases in spirits consumption after the mid-1990s is an interesting question. This sort of temporally distal causal attribution usually falls outside the scope of investigations into the effects of policy changes. National spirits consumption started rising gradually after 1998, which may mean that Iowa’s more recent upward trend was occasioned in part by broader shifts in U.S. drinking culture or circumstance. It is, however, interesting – maybe even tantalizing — to contemplate whether Iowa’s privatization of spirits in 1987 lent itself, in some small or not quite so small way, to a longer-term lessening of the gap between Iowa’s and national spirits consumption levels. What, then, has all this to do with Washington State’s privatization ballot measure? Well, let’s see: First off, Iowa’s change in post-liquor-privatization was obviously nothing like the CDC’s oft quoted estimate in the Washington debate. Instead, spirits consumption trended downward, after a post-privatization blip, for seven or eight years afterward. Second, readers might well be a little wary of the pronouncements of experts regarding issues like privatization. As the conflict above demonstrated, experts on alcohol may voice differences of opinion quite as heated as those found in the political arena. Third, it’s possible — though outside the range of conventional scientific authority — that Iowa’s later, longer term upward trend in spirits consumption owed some small or not so small measure of causal contribution to the 1987 privatization; this possibility, however, is a matter more for speculation than reliable science. How much Washington’s spirits consumption may be affected by privatization, should 1183 pass, remains an open question. Washington, as my chart shows, shadows U.S. spirits consumption trends quite closely over time. Hence, there is no gap to be closed between state and national consumption levels, as was suggested in Iowa longer-term trend. Finally, it might be noted that Iowa’s changeover happened at a moment in U.S. and Iowa history when spirits consumption (and alcohol consumption in general) was declining. Today, on the other hand, spirits consumption in Washington and the nation may be slowly trending upward, although rates over the past three years have been pretty flat. Nevertheless, this difference in the broader trend direction between today in 2011 and Iowa in 1987 may further limit the applicability of Iowa’s experience in the 1980s to Washington’s in a post-privatization future. Edwards, G. et al. (eds. ), Alcohol Policy and the Public Good, New York: Oxford University Press, 1994. Holder, H.D., Privatization of Alcoholic Beverage Control: A Case Study From the State of Iowa, U.S.A. Paper presented at Kettil Bruun Society1988 Annual Meeting, Berkeley, Calif.: Prevention Research Center, 1988 – cited in Mulford et al., 1992. Holder, H.D. and Wagenaar, A.C., “Effects of the elimination of a state monopoly on distilled spirits’ retail sales: A time-series analysis of Iowa,” Brit. J. Addict. 85:1615-1625, 1990. Mulford, H.A. and Fitzgerald, J.L., “What Happened to Wine Consumption in Iowa Following Elimination of its Retail Wine Monopoly,” letter, J. Stud. Alcohol 57:572-575, 1996. Mulford, H.A., Ledolter, J., and Fitzgerald, J.L., “Alcohol availability and consumption: Iowasales data revisited,” J. Stud. Alcohol 53:487-494, 1992. Wagenaar, Alexander C. and Harold D. Holder, “The Scientific Process Works: Seven Replications Now Show Significant Wine Sales Increases after Privatization,” letter, J. Stud. Alcohol 57:575-576, 1996. This is an interesting historical trend. I’m trying to track use-trends with other substances and find it challenging at best given U.S. federal survey structures. I-1183 would close 166 state-run liquor stores and allow 1,400 grocery stores to start selling liquor next June. But liquor wouldn’t be any cheaper under I-1183. In the best-case scenario, according to state estimates, liquor prices would stay the same. Worst case, the average price for liquor increases 20 percent. And unlike I-1183’s predecessor, Costco’s failed liquor initiative I-1100 (which the SECB backed last year), this initiative transfers the state’s liquor monopoly to a handful of large retail chains. Under I-1183, only stores with 10,000 square feet would be eligible to sell hard alcohol—that’s stores like Costco, Safeway, QFC, and Trader Joe’s. Your small local grocer won’t be selling liquor if this thing passes. On top of that, I-1183 imposes a 10 percent tax on liquor distributors but creates a giant loophole that allows grocery chains—the big corporations who are bankrolling this thing—to bypass distributors and buy liquor tax-free. Thanks for your comment, Ingrid! Washington’s Liquor Board is in a sense an atavistic holdover from a by-gone era, when many temperance movement concerns still held considerable sway over the then-new post-Repeal regulatory environment for alcohol. In that same sense, the battle over 1183 raises old rhetorical motifs – including, e.g., the protection of the innocent (esp. youngsters), the evil potentials inherent in liquor (esp. car crashes/fatalities), and the greedy hand of capitalism stimulating consumption and ensnaring esp. youth in alcohol’s web. How much or how little these arguably-also-partly-atavistic rhetorical touchstones manage to engage the current electorate, and how they do so, represent fascinating questions. The temperance movement has made a partial come-back in the U.S. alcohol area in the form of the public health approach to alcohol (see my http://www.roizen.com/ron/postrepeal.htm on this). Hence, there are new hooks out there to hang some or much of the anti-1183 rhetoric upon. Prop. 1183 represents, in effect, a new fight over an old system with a shadowy recrudescence of an old popular paradigm operating in the dim background. The rhetoric of the ads, as you point out, often has little to do with the real interests of the pro-side and the nay-side of the pre-election debate. Hence, interpreting that gap between underlying realities and rhetorics represents yet another fascinating problem.